Over the last thirty years, historical studies of building types have become something of a growth area. As well as such general surveys as Nikolaus Pevsner's History of Building Types, there are growing numbers of studies of individual types, of which the most distinguished perhaps remain Mark Girouard's Life in the English Country House and Robin Evan's study of prisons, The Fabrication of Virtue. This growth is not surprising, because the subject lends itself to the 'New Art History', and to our increasing desire to set buildings within their social and cultural contexts, as well as their stylistic and cultural ones. 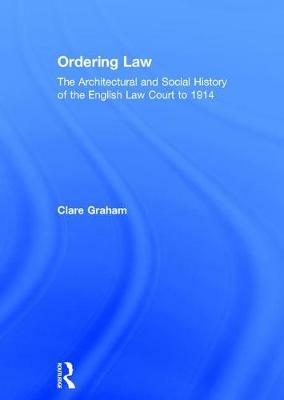 This book by Dr Graham is a comprehensive study of a type of building - the law court - which has, to date, remained largely unexplored. Ordering Law establishes when, why and how the trial came to be housed in purpose-built accommodation in England, and what was architecturally distinctive about that accommodation in the period leading up to 1914. The main text concentrates on examining in depth a series of well-documented individual buildings and groups of buildings, using a wide range of contemporary sources to illuminate the way in which they were designed and used. Other information gleaned about court buildings nationwide is placed in an appendix, in gazetteer form; originally drawn from the 200 or so examples listed in the Buildings of England guides, this has expanded to include over 800 entries. As a piece of scholarly research, this work draws on several disciplines and will be of interest to those studying social and legal history, as well as those with a broader interest in architectural history.